So, I thought I had this Twitter thing down. I would check in about once a week, by just scrolling through my feed. Clicking to expand on links that looked interesting. I learned about these things called “hashtags” (#). I started using #s to search for things that caught my attention, it helped to funnel the information for me. 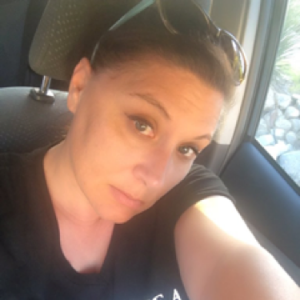 I was watching, I was reading, I was learning…I was even growing as an educator. I was a great consumer. This was working for me…until…May 25, 2015. 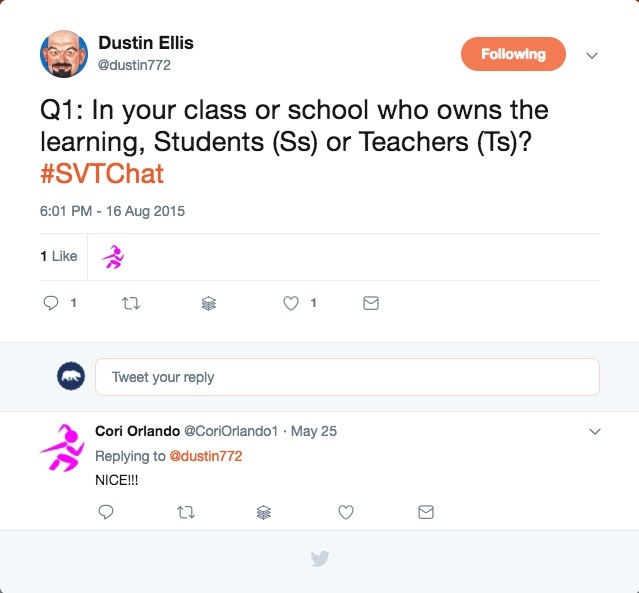 My colleagues Dustin Ellis and Steve Petriologo (one of our principals) decided to start a Twitter chat called #SVTChat (Simi Valley Teacher Chat). I had NO CLUE what they were even talking about, but decided to join in, to support them. Dustin recently found the very first Tweet from that chat. I obviously didn’t know what in the world I was doing. I didn’t even answer the question! But hey, I made an attempt. I don’t remember the exact number of people that were in that first chat, but it was small enough that I felt somewhat comfortable actually creating and not just consuming. Little did I know…that little chat would be a game changer. More on that in the next post. When I try to encourage others to join in Twitter chats I try to share the power. I am often met with “What is the point of Twitter chat?”. Great question! The power of these chats comes from what you put into it and what you take out of it. It is easiest to explain with the good ol’ 4 ws (and an H). Anyone can join any chat. That is one of the beauties of Twitter. The walls are flattened. You will find yourself in chats with some of the “Top Dawgs” in our field mixed with people that are just starting out. You will chat with authors, leaders, teachers, students…you name them, you will eventually chat with them. Most people that you will find in these chats are there to learn, grow and share with others, just like you! It is a great collaborative space. I might liken a chat to the old “discussion forums”. These are live discussions that take place at a certain time and space. A chat is usually wrapped around a specific topic. The topic may change or stay the same. You can follow or participate in a chat by searching a specific # (hashtag). The moderators (hosts) will Tweet out a question (usually with Q1, Q2… and ending with the specific #). The participants then answer the questions (Starting with A1, A2…and ending with the specific #). You get to choose your comfort level and how you want to participate. There will be powerful learning and growth, no matter how you choose to interact. There are Twitter chats happening all the time. Find one that matches your passions, your needs, your areas of strength or areas of growth. Check out: Educational Twitter Chats for some examples. Life nor education should be a game of Solitaire. We need others. We are all better together. We need to risk, learn, grow and share forward with others. After you find a time and chat you would like to join, you simply put the # into your twitter search and go! *My personal preference is to create a column in Tweet Deck. Once you are ready to roll, there are a few different levels of chat participation. We have all gone through the continuum, you will get something out of it no matter what. Lurker: This is someone who watches, reads and learns. Liker: This is someone who watches, reads and learns but also contributes by “liking” other people’s tweets. *When you “like” someone’s tweet, they are alerted and it is “saved” for you under your Twitter profile, under “likes” if you would like to review later. Retweeter: This is someone who watches, reads and learns but also re-shares someone else’s Tweets. *When you do this, all of your followers will see that you re-shared a tweet and the originator will be alerted. Replier: This is someone who watches, reads and learns but also contributes. You can reply to anyone’s tweets, to add on to their conversation. All of your followers and the originator will see your reply. *Please make sure to also add the chat # so your fellow “chatters” will see and add on. Responder: This is someone who watches, reads and learns but also answers the questions. You can do this by creating a new tweet, replying to the “question tweet” or “quoting with a retweet” of the “question tweet”. Regardless, it is important to start with A1, A2…and end with the chat #. My call to action is: Just give it a shot…actually, give it a few. Try out a few chats and get your feet wet. I promise, you will get something out of them! There is a #BetterTogetherCA chat on the first Monday of every month at 7pm. You should check it out and follow @cateachersummit for regular updates of other great chats to check out. I want to share with you that the magic is what happens beyond the chats…beyond the 140 characters. When you start to build your PLN (Personal Learning Network). THIS is an absolute game changer. We will discuss this in the next blog post: The Ripple Effect.